Mitsubishi Outlander PHEV Forum • View topic - For people disappointed with Range in EV. For people disappointed with Range in EV. Post subject: For people disappointed with Range in EV. Now in May 2015 I discussed this topic over in the Technical section when my 1st PHEV (bought new) was about 1 year old so remember my drive battery was in a better condition than now but I still think the information is relevant. Now some of this is just copied and paste from that discussion to make it easier for me and I have deleted or changed some bits to make it more relevant for today. So lets get onto the topic. So for people disappointed about not getting the advertised range in EV mode that Mitsubishi stated in their brochures etc . I wish to discuss this in a rational manner. Well I think they were designed to get around the suburbs or cities where the majority of the population live using electric power. Now you may not agree with this statement and when you have vehicles like the Tesla with their bigger batteries I would probably agree. But I will stick with smaller drive battery types like our PHEV. So what are speed limits of the cities or suburbs that I think these EV vehicles were designed for well IMO I would say MAINLY 60kph or 35mph or less. Now before I get FLAMED for making that statement I know that cities have motorways or even tollways here in Australia that can pass through them where you can travel at higher speeds and sometimes even what we call 80kph zones here but in all my travels from here to North America, Asia, Europe and Great Britain and certain islands in the Pacific 60kph or 35mph or less is MAINLY what you will see around the suburbs IMO. I am sure you will tell me if you think I am wrong. So how does the Phev go at these MAINLY lower speeds? Well for me I can only get the "advertised" range of about 50 kms (when the PHEV is new) in light traffic conditions ie not as many red lights or stopping. When I say the traffic is light I do not mean non existent. This is with no heating or A/C and good weather ie no rain etc. Now am I pissed off with Mitsubishi that I can only get the advertised range in light traffic and MAINLY lower speeds. No. Because actually our Australian Government set the rules for how Mitsubishi test the EV range and other countries have similar rules I think or use a certain standard. I will break up this post here and continue this later. Post subject: Re: For people disappointed with Range in EV. Ok I only put this in for mainly what it says underneath. So there is only 8.4kWh usable in the High Voltage (HV) drive battery. Notice the top right side of the image where it shows 8.6 x 8.4 = 73km (8.6km/kWh from red box on display x 8.4kWh usable HV battery capacity gives 72.24km) in ev mode. If only I could get those figures. ...... I am still laughing. 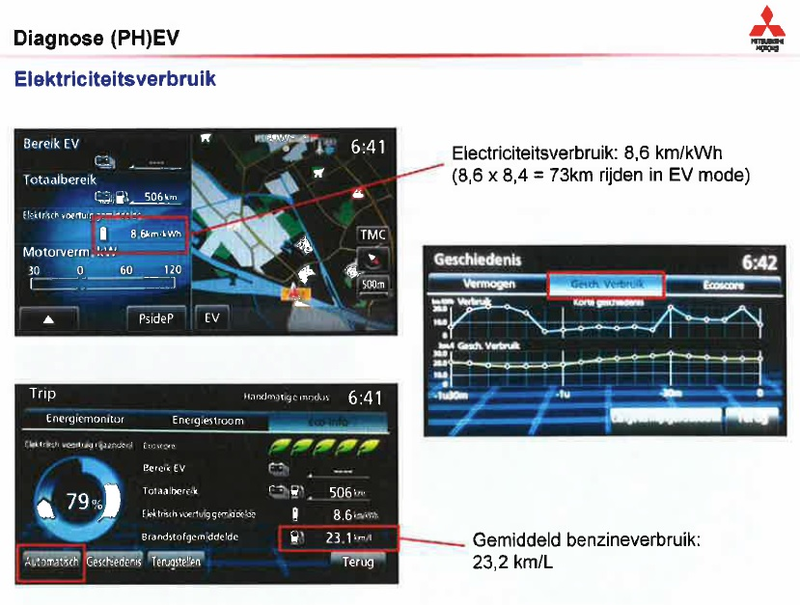 It also says if we can get 17kWh/100km or less in the display where the red box is we should get about 50km or more in ev mode. Around town where I live (60kph speed limit) when the traffic is light (very few red lights) I can get about 50kms. Now there being approx 8.4 kWh usable from the drive battery when the PHEV is new lets look at this. Now at 60kph (37mph) on a level road I see on the center display of my Phev 7.5 kW of power being used. If we could find a road or a racetrack where we could drive and not have to stop travelling at 60kph and it is fairly flat and not counting the original acceleration energy of getting up to 60kph (37mph) we will travel roughly 67kms or about 41.5 miles for others. Just thought I would throw that out there. Ps I should state that this is with is no AC, no heating, tyres up to pressure, good weather etc etc for the 7.5 kW reading I get on the display. The image was from MMC and kindly provided to me by anko. edit Bring in full section from sticky. Last edited by Trex on Mon Feb 11, 2019 3:12 am, edited 1 time in total. I think that the issue on this side of the world was that Mitsubishi were very pleased to follow the government testing line regarding EV range and some of their early advertising gave an unrealistic expectation. Having been a Prius owner, I did understand the likely discrepancy between the laboratory figures and reality on the road, but I am not surprised that some of those early puchasers with no prior experience of hybrid or pure EVs felt hard done by. 4. Cost ... I think I can get 2 to 3 PHEVs for the cost of 1 Tesla. A PHEV is a PHEV and should not be compared with BEV and on this forum I often see the drift. Once we accept we are driving PHEV and have to put in petrol from time to time we are at peace !! In my experience after having owned my PHEV for 3 1/2 years, it uses around 200Wh/km in suburban driving conditions. That equates to about 42km from the usable battery capacity. This is the actual measured energy that comes out of the power point to recharge it! So, for me, being semi retired and mainly using the car locally, this is perfectly adequate and for many working people doing the average commute at around 30km/day it should be too. In my opinion, this type of use is what this car was primarily designed for and it does it very well. Anyone who far exceeds that daily mileage and therefore fully cycles the battery, perhaps even more than once a day, should probably look at some other vehicle as it will not live up to expectations. Comparing fuel usage on longer trips with a diesel or petrol powered car, while interesting, it is really pointless because it isn't designed to be a regular long distance car. The same goes for people who wish to regularly tow, while it can do it, it would not be my first choice. How much Mitsubishi Australia pays for promote the "brand" with disinformation? It seems to me after several months of ownership in the UK that the 2 factors which most affect EV range are temperature and speed. I agree that if you mainly drive gently and below 50mph (80kph) the range achievable is close to the advertised one if the temperature is not too low. Recently with temperatures not much above freezing range seems to be some 66% of that achieved at higher temperatures. Overall though I am happy with the performance of my car in both EV and petrol modes given that it is a large, heavy and unaerodynamic 4x4. ....................and some of their early advertising gave an unrealistic expectation. Maby, does this mean that their recent advertising is now more realistic? love that bit about the "not a sleek and sporty piece of eye-candy".